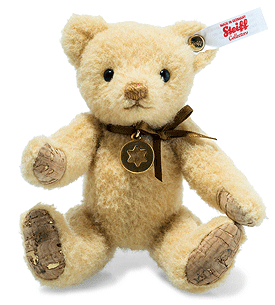 Stina Teddy Bear by Steiff, maybe small but beautiful. she is a limited edition Steiff item, hand made in honey wool plush with paw pads made of cork. Her eyes are black and her nose is hand stitched in old-gold colour thread. Worldwide Limited edition of only 1000 pieces. Product details: fully jointed, safety eyes, filled with synthetic filling material, non growler, size 13cm.